Paul Walker to Narrate IMAX 3D Documentary, "Air Racers 3D"
LOS ANGELES, PARIS and LONDON /PRNewswire/ -- 3D Entertainment Distribution announced that actor Paul Walker (The Fast and the Furious franchise, Takers) will narrate Air Racers 3D, the first-ever IMAX 3D theatre film devoted to the fastest race in the world: the legendary Reno National Championship Air Races. With stunning aerial photography filmed entirely in 3D and unprecedented access granted to the course, Air Racers 3D takes audiences into Nevada's Valley of Speed to experience the intensity and high-speed thrills of a sports event like no other combined with spectacular air show entertainment. "We are truly honored and delighted to have Paul Walker lend his storytelling talents to this action-packed 3D film, which will hit IMAX theatres in the US beginning this April," said Francois Mantello, Chairman and CEO of 3D Entertainment Distribution. "His passion for racing and high-adrenaline sports makes him a perfect fit for this celebration of aviation." "I have always been fascinated by the sheer power, precision and skills of these tremendously talented pilots who race just 50 feet off the ground at twice the speed of a Nascar race," said Paul Walker. "I was further drawn to the film by its unique historical view of this legendary sport and for the educational insight into the science of flying that it provides." "We are delighted to have Paul Walker be such an integral part of this film," said Air Racers 3D co-directors Christian Fry and Jean-Jacques Mantello. "His ability to connect with moviegoers of all ages, and teenagers in particular, as well as his genuine love of motor sports unquestionably enhances this ultimate air show experience." Having captured the attention of audiences and industry executives alike with his undeniable on-screen presence in a string of supporting roles, Paul Walker's breakout role was as undercover cop Brian O'Conner in the 2001 hit film The Fast and The Furious. Since then, he has managed a balance of box-office films and dramatic roles to cement his leap to leading man status. Walker has demonstrated his on-screen versatility by transforming into a soldier under the direction of Clint Eastwood, an Arctic research scientist in a Disney family adventure, and a New Jersey mobster in a gritty independent feature. Walker, who also made a return in the fifth installment of The Fast and The Furious franchise, recently starred in and executive produced Vehicle 19, an indie thriller set for release in 2012. From the pits to the roaring sky, Air Racers 3D explores the highly competitive world of air racing through the eyes of rookie pilot Steve Hinton as he attempts to fly his P-51 Mustang fighter plane to victory in the most highly-anticipated and unpredictable race class. Audiences will discover today's elite pilots in their World War II-era aircraft as they fight for position, wingtip to wingtip, and skim 50 feet (15 m) above the ground around an oval course at 500 mph (805 km/h). The film also features rare archival footage and performances by many of the world's top aerobatic pilots, including the Royal Canadian Air Forces Snowbirds. Produced by 3D Entertainment USA and Pretend Entertainment in association with Stereoscope, Air Racers 3D is directed by Christian Fry and Jean-Jacques Mantello (Sharks 3D, Ocean Wonderland 3D and Dolphins and Whales 3D) and features a screenplay by Christian Fry and Rick Dowlearn. The musical score is by Christophe Jacquelin. The film is produced by Christian Fry and Raul Leckie, and executive produced by Francois Mantello, John Constantine and Jeffery Pierce. Two years in active production, principal 3D photography for the film took place during the 2009 and 2010 Reno National Championship Air Races and was completed in June 2011. CIRQUE DU SOLEIL: WORLDS AWAY in 3D will open on Friday, December 21, 2012. FUN SIZE will open on Friday, October 26, 2012. MY MOTHER’S CURSE is now titled THE GUILT TRIP. The release date remains Friday, November 2, 2012. VIZ Media, the largest distributor and licensor of anime and manga in the North America, announced today that Warner Bros. Pictures has acquired the live-action feature film rights to the hit manga and anime property BLEACH. The announcement comes after another successful year for BLEACH in print, digital publishing, cable television, streaming video, consumer products and video-on-demand. Peter Segal (GET SMART, THE LONGEST YARD) of Callahan Filmworks is producing with an eye toward directing. The film’s creative team also includes screenwriter Dan Mazeau, who recently penned Warner Bros.’ upcoming sequel to CLASH OF THE TITANS. Callahan Filmworks partner Michael Ewing and Masi Oka (best known for his roles on NBC’s HEROES and CBS’s HAWAII FIVE-0) will produce. From VIZ Productions, Hoffs will serve as Producer, and Branon Coluccio will be Executive Producer. Screenplay development will commence in 2012. The popular BLEACH animated and manga series, created by Tite Kubo, follows the adventures of Ichigo, a teenager with the ability to see ghosts. When his family is attacked by a Hollow — a malevolent lost soul – Ichigo encounters Rukia, a Soul Reaper tasked to hunting Hollows, and inadvertently absorbs her powers. Now, Ichigo must dedicate his life to protecting the innocent and helping tortured souls find peace. BLEACH is a tremendously successful multimedia property around the world. The manga has been licensed to more than a dozen countries and has over 75 million copies in print in Japan alone. In North America, the manga (rated ‘T’ for Teens) has consistently appeared on the New York Times Best Seller list for Manga and the Neilsen BookScan Top 50 Graphic Novels list, selling more than 2.1 million copies across 36 volumes. The BLEACH manga is also available digitally through VIZManga.com and for download through the VIZ Manga App for iPad®, iPhone® and iPod® touch, where it has proven to be a top-seller. The series was recently sped up to bring North American readers up-to-date with the latest story arc in Japan, culminating in it being featured in WEEKLY SHONEN JUMP ALPHA, the groundbreaking digital manga magazine that VIZ Media just launched at the end of January 2012. The BLEACH animated series (rated TV-14) has topped the ratings on Cartoon Network’s Adult Swim, sold over 1.8 million DVDs and consistently ranked among Hulu’s most watched shows, This success has further spawned an array of related video games (over 820,000 sold), apparel, action figures, trading cards and other merchandise. For more information on BLEACH and to view free streaming episodes, please visit Bleach.viz.com. For more information on BLEACH digital manga, please visit VIZManga.com/bleach. For more information on WEEKLY SHONEN JUMP ALPHA, please visit SJAlpha.com. Good Deeds is a 2012 romantic drama from writer/director Tyler Perry. Although Perry is also the film’s lead actor, this isn’t a “Tyler Perry film,” as far as what we generally expect of a Perry film – broad comedies often featuring the character, Mabel “Madea” Simmons, who does not appear in this movie. Good Deeds is about a businessman who leaves his comfort zone to help a struggling single mother. Wesley Deeds (Tyler Perry) is a San Francisco-based businessman who is CEO of Deeds Corporation, the software company his late father started. He is engaged to marry Natalie (Gabrielle Union), a beautiful young woman who works in real estate, but his mind is always on work. With the assistance of John, (Eddie Cibrian), a company executive, Wesley is currently trying to buy a rival company, but Wesley’s resentful younger brother, Walter Deeds (Brian White), may be trying to sabotage the company. Their mother, Wilimena (Phylicia Rashad), is totally plugged into planning the wedding. Wesley Deeds does what he is supposed to and expected to do. However, Wesley is jolted out of his scripted life when he meets Lindsey Wakefield (Thandie Newton), a single mother who is a janitor in Wesley’s office building. Lindsey speaks her mind and is fiercely independent, but when she and her daughter, Ariel (Jordenn Thompson), are left homeless, she needs help. A chance encounter brings together two people who are in a really bad place in their lives. If Wesley Deeds can be said to leave his comfort zone in this story, then, it can be said that Tyler Perry, for the most part, leaves his comfort zone to create Good Deeds. This is an uplifting movie that emphasizes living the life one wants to live (or trying to) by relying on one’s self. In this movie, Perry pushes believing in yourself as a vehicle of change rather than a belief in faith and God as the path to change. 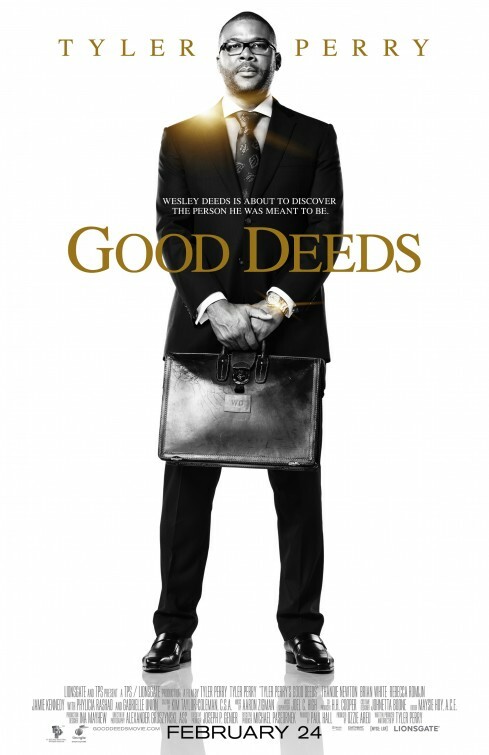 Good Deeds is by no means anti-religion, but this is the most secular film Perry has done to date. The religious themes and testifying that are so evident in his broad comedies are absent in this romance and drama. I was also surprised by how well written the screenplay is, considering (once again) that Perry has left his broad comedy comfort zone. Good Deeds does sometimes come across as an African-American soap opera (especially the elevator scene late in the film). However, this is also a character drama that puts a laser focus on Wesley Deeds and Lindsey Wakefield. Perry really delves into these characters and pulls out their insides so that the audience can see what makes them tick. Perry shows the audience the inner conflicts and struggles as much as he depicts Wesley and Lindsey’s exterior drama. I think that Thandie Newton is, as usual, very good. She can do trials and tribulations as well as any African-American actress, and better than most. Perry, on the other hand, is mostly hit or miss as Wesley. There are moments in which he just does not seem convincing as an upper class Black man from an old money African-American family with an Ivy League pedigree. Another of the film’s faults is that it largely ignores some of the other characters that have potential: Walter and Wilimena Deeds and Natalie, in particular. Perry created three good characters in them, but gave them small spaces to shine except in moments that seem like little more than stereotypical melodrama. Young Jordenn Thompson as Lindsey’s daughter, Ariel, also steals a few scenes. Still, Good Deeds is really about Wesley and Lindsey, and to that end, the film is a pleasant drama that has a few riveting moments. These moments can jerk some tears from the audience, and that’s surprising to me. I didn’t expect even that much from Good Deeds. I won't go there on the age thing, but I hope you have a great birthday and many, many more. The Academy Award is an award bestowed by the American Academy of Motion Picture Arts and Sciences (AMPAS). The award recognizes the excellence of professionals in the film industry, including directors, actors, and writers. Winners and honorees receive the Oscar statuette, which is officially named the Academy Award of Merit and is one of nine types of Academy Awards. The first Academy Awards ceremony was held on May 16, 1929, at the Hotel Roosevelt in Hollywood to honor outstanding film achievements of the 1927/1928 film season. The 84th Academy Awards, which honored films in 2011, was held at the Hollywood & Highland Center Theatre on Sunday, February 26, 2012 and broadcast live on ABC. Meryl Streep won the best actress Oscar, which I wanted Viola Davis to win. Woody Allen won his third Oscar for screenwriting (his fourth overall) with his win for Midnight in Paris. The state of Louisiana was represented in victory when William Joyce and Brandon Oldenburg of the Louisiana-based Moonbot Studios won the best animated short film Oscar. Meryl Streep Wins Best Actress Oscar for "The Iron Lady"
Michel Hazanavicius Wins Best Director Oscar for "The Artist"
Woody Allen Wins Best Original Screenplay Oscar for "Midnight in Paris"
The Film Independent Spirit Awards is an annual celebration honoring artist-driven films made with an economy of means by filmmakers who embody independence and originality. The Spirit Awards recognizes the achievements of American independent filmmakers and promotes the finest independent films of the year to a wider audience. This is the 27th year of the Film Independent Spirit Awards. The 27th Film Independent Spirit Awards were given out in a televised ceremony on Saturday, February 25, 2012. The Artist won the best picture and best director awards and now seems like a runaway train on the way to tonight's 84th Academy Awards. The 37th Cesar Awards were presented on Friday, February 24, 2012. The French film, The Artist, which is poised to win big at the 84th Academy Awards tonight, won 6 of the 10 categories in which it was nominated, including "Best Film." Also of note, Roman Polanski shares a screenwriting award. Gregory Gadebois, "Angele et Tony"
Clotilde Hesme, "Angele et Tony"
Sylvain Estibal, "When Pigs Have Wings"
Yasmina Reza, Roman Polanski, "Carnage"
PRODUCERS: Mark Brown, Robert Teitel, and George Tillman Jr.
Barbershop, a recent co-production by Ice Cube’s film production company Cube Vision and State Street Pictures, is another in a recent spurt of so-called urban audience movies, i.e. movies for black people. However, the light-on-plot film was a huge hit that drew in a broad cross section of viewers, so even white folks can be entertained by film’s with little or no story as long as the characters are funny and engaging, as they definitely are in Barbershop. Calvin Palmer (Ice Cube) is a barber like his father and grandfather before him, but Calvin has bigger dreams. He inherited his late father’s shop, but Calvin has also saddled himself with debt from a number of failed business ventures. Looking for cash to help him with his latest start up, he sells his barbershop to a loan shark, Lester Wallace (the wonderful, but seldom seen Keith David). After he takes that big step, he comes to regret his decision when he realizes that Wallace is going to turn the shop into a ho house. That really hurts because his father’s business always meant a lot to the local community. I can forgive the weakness of the film’s plots (and subplots) because it is rich in funny and endearing characters. To be of quality, a film doesn’t have to have great characters, a great setting, and a great story; the finest and most artful films do. A good film can be strong and entertaining with just one of those elements. Barbershop holds our attention because the characters are so damned funny. The acting isn’t always tight, but the cast really gets into their characters and give a good show. In an odd way you can forgive Barbershop a lot of faults because you know that you’re always going to get another hilarious scene with these great characters. Out of all the actors, Anthony Anderson captured my attention just as he has in Romeo Must Die, Big Momma’s House, and Life among others. He’s funny, hilarious in fact, in the tradition of portly funny men. Ice Cube is nowhere near being a good actor, but he has an excellent sense in choosing film projects that will appeal to a broad audience, whether it’s popular trash like Anaconda, a sleeper hit like Friday, or a daring filmmaking choice like Three Kings. He’s a movie star. PRODUCERS: Robert Teitel and George Tillman Jr.
Barbershop 2: Back in Business is a hilarious character based comedy that easily surpasses its admittedly funny 2002 predecessor, Barbershop. Like the first one, Barbershop 2 relies on funny characters to carry the movie and a homey setting in Chicago’s Southside to establish the atmosphere. Shop owner Calvin Palmer (Ice Cube) has settled into being a small business owner, and his shop is thriving. The barbers who rent from Calvin are gregarious people who are fun to be around, so many locals gravitate to Calvin’s shop for a haircut, bawdy jokes, and the generally funny atmosphere. As in the first film, Calvin is still struggling to save his shop – this time from greedy urban developers who want to buy him and his neighbors out. They want to replace “mom & pop” business with name brand chains – including a rival barbershop called Nappy Cutz. If that wasn’t enough, some of his employees/renters are starting to get on each other’s nerves, so can Calvin save his shop and neighborhood, while dealing with complex and messy interpersonal relationships? However he chooses to deal with problems will certainly involve laugher. 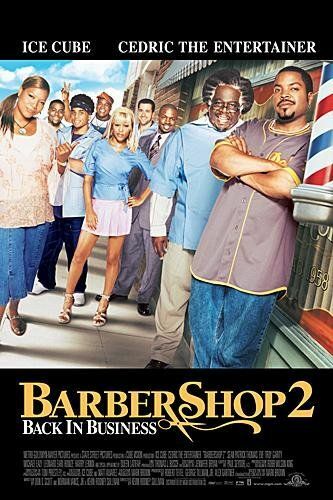 Anyone who liked Barbershop should like the sequel, and I can imagine many people who didn’t like the first will enjoy Barbershop 2, since it is almost twice as funny as the original. 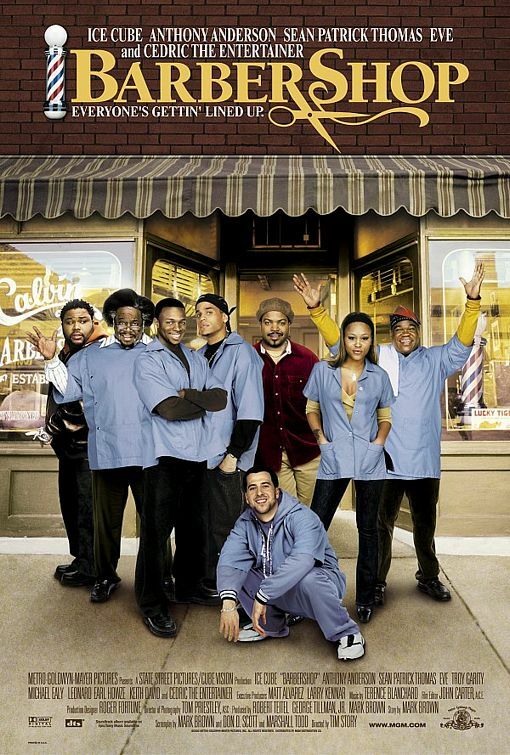 Barbershop 2’s script simply has more zest, and the comedy flows naturally. The first time around the laughs became old shtick, and the movie lost steam. The story and plot here is relatively light, and the little guy business versus the corporate devils is a familiar tale. However, the execution of the plot and routines of the characters have a better rhythm and the timing’s impeccable. Every thing seems to happen just when the films needs a boost or needs to move onto the next joke or funny scene. As far as character pieces go, Barbershop is a work of art. In the end, the filmmakers wrap up Back in Business with a bit too much ease. Even this lightweight story ended up having the potential to say a lot about tradition and community over greed and progress, but maybe they believed that dealing with such weighty subject matters would turn a character comedy into ensemble drama. And we did come for the laughs. What Barbershop 2 misses in dealing with real world issues, it more than makes up for in being a good time, feel good comedy that just may keep audiences laughing for years. Oh. Barbershop 2 isn’t a BLACK movie. It’s a funny, broad comedy featuring a primarily African-American cast, but it’s laughs and lightweight pass at values should appeal to peoples. The Costume Designers Guild is an international group that represents motion picture, television, and commercial costume designers, assistant costume designers and costume illustrators. The Costume Designers Guild Awards began in 1999 to annually honor costume designers in Motion Pictures, Television, and Commercials. The winners were for the 14th Annual Costume Designers Guild Awards were announced at an awards gala Tuesday, February 21, 2012. This day almost got by me (Thanks, Microsoft Works calendar). I wish you a Happy Birthday and many, many more. 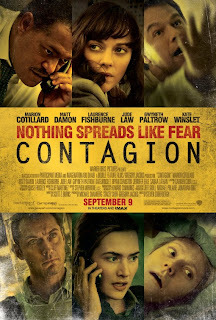 Contagion is a 2011 film from director Steven Soderbergh. 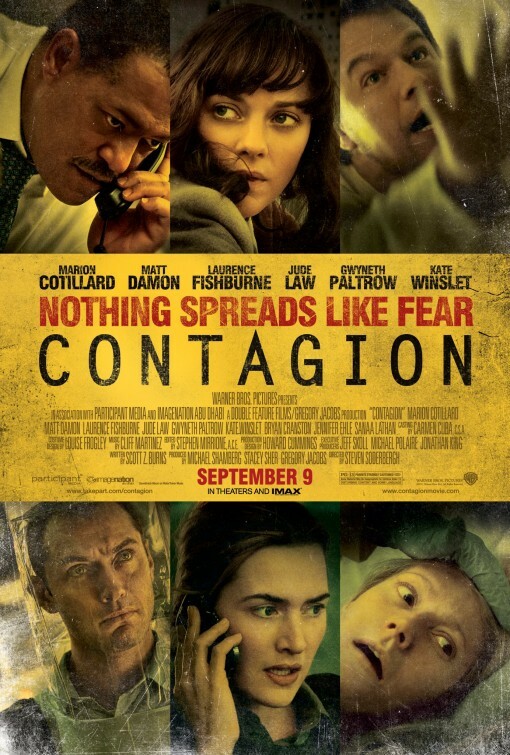 Essentially an ensemble drama and thriller, Contagion documents the spread of a virus that turns into a global pandemic, causing worldwide social chaos. Meanwhile, government officials try to contain it and medical officials try to identify the virus in order to create a vaccine for it. Contagion is a smart, scary disaster movie that will simultaneously give you the creeps while making you wonder if you are prepared for a pandemic. The film begins by focusing on Beth Emhoff (Gwyneth Paltrow), a businesswoman in Hong Kong. Unbeknownst to her, Beth returns to the United States bringing with her a pestilence that will leave half her immediate family dead. From there, the story focuses on countless players dealing with the aftermath of the virus that is eventually named, MEV-1. Beth’s husband, Mitch Emhoff (Matt Damon), balances his need to protect his daughter, Jory (Anna Jacoby-Heron), who is frustrated with the quarantine, with her need to be a teenager. Alan Krumwiede (Jude Law), an Internet blogger who is obsessed with conspiracy theories, schemes to make money off the chaos created by the spread of the virus. At the Centers for Disease Control and Prevention (CDC) in Atlanta, Dr. Ellis Cheever (Laurence Fishburne) leads a team trying to identify the virus, contain it, and create a vaccine for it. A World Health Organization (WHO) epidemiologist, Dr. Leonora Orantes (Marion Cotillard), travels to Hong Kong to trace the origin of the virus. CDC scientist, Dr. Ally Hextall (Jennifer Ehle), feels the pressure to find a cure, so she makes a decision that is either selfish or selfless. Meanwhile, fear and mass hysteria spread faster than the contagion. Contagion has no single protagonist and no outright human antagonist. However, because it is an ensemble drama, Contagion can explore multiple themes, such as mass panic, loss of social order, the limitations of government during a disaster, cronyism, and greed, etc., from the view point of multiple characters. Director Steven Soderbergh has this film jumping from one character and plot to the next. Because the characters are so well-defined and the plots so riveting, he always leaves the viewer wanting more, which can directly engage the viewer with the story, almost as if it were a real event. Contagion’s ultra-realism makes the movie feel more human and less post-human like so many modern, computer effects enhanced film thrillers. Of course, Soderbergh has an excellent multi-layered script by Scott Z. Burns from which to work. This reach and scope of this screenplay practically demands that Burns or someone else turn it into a novel. Contagion is by no means perfect. It burns so hot, which is why it is so intense as a thriller, but Soderbergh needed to dial that back a few notches in certain parts of the story. Sometimes, the film is too aloof when it needs to stop and focus longer on certain characters in certain scenes. Steven Soderbergh laid down the law to his large cast of stars for his low budget ($2 million) film, Full Frontal, denying them the amenities that movie stars have come to expect on the sets of films in which they appear (star). Apparently, he really wanted the focus to be on actually making a film and less on the celebrity politics of Hollywood filmmaking. Full Frontal is one of those “meta” films like Spike Jonze’s two films, Being John Malkovich and Adaptation, in which there is a film within a film within a film, a story within a story, and a play within a play. All the elements: filmmakers, actors, characters, settings, story and script blend together to create some kind of hyper fictional/documentary movie hybrid. Full Frontal follows a day in the life of a group of men and women in Hollywood as they approach an evening birthday party for their friend Gus/Bill (David Duchovny). If you’re wondering why Duchovny’s character has two names it’s because this is a movie within a movie, and some of the film’s characters have dual identities: one is a “real person” and the other is a fictional character. If this is confusing, it is because Full Frontal can be very hard to follow, unlike the aforementioned Spike Jonze films which were both written by Charlie Kaufman and which were both very easy to follow. Julia Roberts and Blair Underwood (an under appreciated and underutilized actor likely because he is Africa-American) play dual parts and it’s a doozy to separate the lives of four characters that are so alike both professionally and personally. The script by Coleman Hough has that thing we all look for in a story that’s supposed to engage us – pathos. It is a fine dramatic presentation of several slices of several lives ably put to words, and Soderbergh expertly captures the sometimes-farcical nature of life and the sometimes quiet, sometimes manic nature of the beast that is romance. Full Frontal is a movie within a movie and a film about filmmaking for people who really like movies. Yes, it’s sometimes confusing and following it is occasionally arduous, but numerous excellent performances, sharp film editing, and some neat star cameos make it worth the effort. Steven Soderbergh is a gifted, imaginative and inventive director who really loves to play around with the process of making movies, so anything he makes is not just interesting; it’s damn interesting. Plus, Full Frontal is such an absolute pleasure to watch, even if it bends the mind one too many times. LOS ANGELES--(BUSINESS WIRE)--Author Kaui Hart Hemmings and screenwriters Alexander Payne, Nat Faxon, and Jim Rash won the 24th-annual USC Libraries Scripter Award for their creative contributions to The Descendants. Selection committee co-chair Naomi Foner announced the winners at the black-tie ceremony on Saturday, Feb. 18. Hemmings noted that the collaboration has been a positive experience for her. “An adaptation can sometimes bring so many more readers that I never would have had and to have those readers say that they love both the book and the film and that they work so well together is such a blessing,” she said. Payne—who was unable to attend—has been a Scripter finalist twice before for his work on the adaptations About Schmidt and Sideways. Payne also directed The Descendants. Faxon acknowledged Payne’s critical decision-making skills in his acceptance speech. The Descendants’ Scripter win adds to its many accolades. The film has been named the American Film Institute’s Movie of the Year and the best film of the year by the Los Angeles, Dallas, Florida, Kansas City, and Southeastern film critics associations, among others. It was named the best drama of the year at the Golden Globes and is nominated for five Academy Awards, including Best Adapted Screenplay. The Scripter gala, presented by the Friends of the USC Libraries, honors each year’s best cinematic adaptation of the written word. Scripter is the only award of its kind that honors screenwriters as well as the author of the work upon which the adaptation is based. With filmmaker and USC alumnus Taylor Hackford (‘67, International Relations) and Academy Award-winning actress Helen Mirren serving as honorary dinner chairs, USC Libraries Dean Catherine Quinlan welcomed the attendees to USC’s historic Edward L. Doheny Memorial Library. The other finalists for the 2012 Scripter Award, in alphabetical order by film title, were: screenwriter Christopher Hampton for A Dangerous Method, adapted from the nonfiction book A Most Dangerous Method: The Story of Jung, Freud, and Sabina Spielrein by John Kerr and the 2002 stage play The Talking Cure by Hampton; screenwriter Moira Buffini for Jane Eyre, adapted from the 1847 book by Charlotte Brontë; screenwriters Steven Zaillian, Aaron Sorkin, and Stan Chervin for Moneyball, based on Michael Lewis’ book, Moneyball: The Art of Winning an Unfair Game; and screenwriters Bridget O’Connor and Peter Straughan and author John le Carré for the thriller Tinker, Tailor, Soldier, Spy. Co-chaired by Golden Globe-winning screenwriter Naomi Foner and USC screenwriting professor and vice president of the Writers Guild of America, West, Howard Rodman, the Scripter selection committee chose The Descendants as the year’s best adaptation from a field of 109 eligible films. The 32-member selection committee included film critics Kenneth Turan and Leonard Maltin; Fox Filmed Entertainment co-chairman and chief executive officer Tom Rothman; screenwriters Eric Roth, Geoffrey Fletcher, and Gale Anne Hurd; author Michael Chabon; and USC deans Catherine Quinlan, Elizabeth M. Daley and Madeline Puzo. Academy Award-winning screenwriter Paul Haggis accepted the 5th-annual USC Libraries Scripter Literary Achievement Award. Haggis’ credits include the screenplays for films such as Crash, Million Dollar Baby, and the two James Bond films starring Daniel Craig, Casino Royale and Quantum of Solace. During his acceptance speech, Haggis spoke about the influence his parents had on his writing career. Haggis—along with author F. X. Toole—also captured a USC Libraries Scripter Award for Million Dollar Baby in 2005. This year’s in-kind sponsors included Esquire Bar & Lounge (Pasadena, Calif.); the Wine of the Month Club; John and Dana Agamalian and Blue Ice Vodka; Barry Eggleston II of the Exotic Car Collection by Enterprise; Final Draft Inc., Movie Magic: Screenwriter; Paperblanks; and thinkThin. For more details on Scripter—including additional images from the ceremony—visit http://scripter.usc.edu/. WRITERS: Kevin Michael Smith & Michael Gozzard, J. Mills Goodloe, and Norman Vance, Jr. 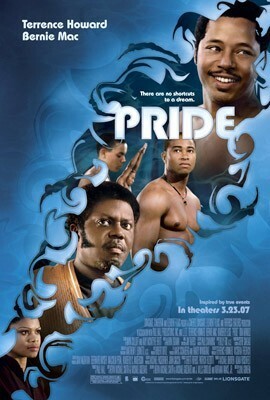 Pride is a 2007 biopic and drama starring Terrence Howard and Bernie Mac. The film is loosely based upon the true story of Philadelphia swim coach, James “Jim” Ellis, who, in 1971, formed the first swim team made of African-American swimmers. In 1973, Jim Ellis (Terrence Howard), a college educated African-American, arrives in Philadelphia looking for work. He lands a job with the Philadelphia Department of Recreation to begin closing the Marcus Foster Recreational Center. Instead, he refurbishes the rundown center’s abandoned swimming pool, and then, shocks this local inner city community by forming a swim team. With the help of the center’s janitor, Elston (Bernie Mac), Ellis forms Philadelphia’s first black swim team. He recruits from a group of young men who hang around the center, and eventually adds one female swimmer. They struggle to be a winning swim team, but soon, Team PDR (Philadelphia Department of Recreation) is earning respect and also the ire of an all-white team, the Barracudas, the swim team of the affluent Main Line Academy. Team PDR heads for their biggest competitive test at the Eastern Regional Swimming Final, but a dark incident from Coach Ellis’ past might sink their dreams. Pride might come across as an amalgamation of many different Hollywood sports movies, especially those based on true stories or real life events. Out of its clichés, however, comes a truly inspirational film that is both an uplifting and moving story about a teacher who encourages his pupils to be not just proud, but also determined and resolute in pursuing their goals. The film isn’t marked by any great performances, but both Terrence Howard and Bernie Mac give high-quality turns as the fatherly and stern, but loving African-American role models. Howard as Ellis seems strangely serene, but he cleverly hides Ellis’ passion and firebrand spirit until the moments that it is most needed. Mac’s performance exposes Elston as a terse, but gentlemanly father figure who simply wants more for the young people of his community. 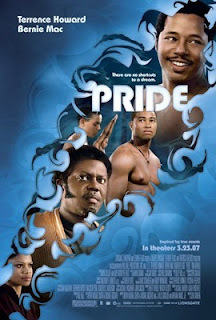 In a time when so many are cynical without really knowing why they should be, a film like Pride will seem like a stereotype. Taken in context, however, Pride is a winning film about a man who taught marginalized children to be proud. Cinema Audio Society Honors "Hugo"
Founded in 1964, the Cinema Audio Society is a philanthropic, non-profit organization formed for the purpose of sharing information with Sound Professionals in the Motion Picture and Television Industry. Cinema Audio Society Awards or The C.A.S. Awards is an annual awards ceremony honoring “Outstanding Achievement in Sound Mixing” and began doing so 1994. Set in Louisiana, Shark Night 3D is a 2011 3D horror movie directed by David R. Ellis, who directed two films in the Final Destination series. I did not see Shark Night in 3D; although I wanted to, it did not play in a theatre near me. After having seen it, I must admit that I am glad that I did not pay the inflated price for a 3D movie ticket to see it in a theatre. The film introduces us to seven Tulane University undergraduates: Sara Palski (Sara Paxton), Nick LaDuca (Dustin Milligan), Beth (Katharine McPhee), Blake Hammond (Chris Zylka), Gordon (Joel David Moore), Malik (Sinqua Walls) and his girlfriend, Maya (Alyssa Diaz). They are going to spend the weekend at an island beach house on a private lake near Lake Pontchartrain. Their weekend of debauchery turns sour when one of them loses an arm in a waterskiing accident. When they discover that the accident is really a shark attack, their weekend becomes a hellish nightmare. If nothing else, director David R. Ellis is a master of gruesome and bloody flesh-ripping death. Final Destination 2 and The Final Destination, Ellis’ two Final Destination films, are the most fun and most ghastly inventive of the lot. Shark Night 3D is similar in style and tone to both of these films, but the story isn’t well-developed nor the script well-written, even for something that is just a youth-oriented horror movie. Ellis and his cast make this work to the degree that it is merely dumb fun. The young actors in Shark Night turn on the passion and dramatic theatrics, and they give it their all. Watching them, you might even get the idea that some of them are fighting for a part in a “Shakespeare in the park” production. This is not Jaws or even Deep Blue Sea, but it’s thrilling and enjoyable. Plus, at the end of the credits, we are treated to an excellent and amusing rap music video featuring these young actors, and they are surprisingly good at rapping. Shark Night 3D doesn’t stop trying to entertain. The Writers Guild of America, West (WGAW) and the Writers Guild of America, East (WGAE) announced the winners of the 2012 Writers Guild Awards for outstanding achievement in writing for screen, television, radio, news, promotional, videogame, and new media writing at simultaneous ceremonies at Hollywood Palladium in Los Angeles and the B.B. King Blues Club in New York City. There are several categories, but I’m listing only the film and television categories. Go here for a complete list of winners. Computer expert Martin Bishop (Robert Redford) heads a team of renegade hackers: a former CIA employee, Donald Crease (Sidney Poitier); a gadgets wizard who goes by the name "Mother" (Dan Aykroyd); a young genius named Carl Arbegast (River Phoenix); and a blind soundman, Erwin Emory, who goes by the name “Whistler” (David Strathairn); they are “sneakers,” routinely hired to test security systems for places that don’t need to get broken into or hacked into, such as a bank. Bishop’s past comes back to haunt him when two men claiming to represent the NSA (National Security Agency) blackmail him into helping them retrieve a “black box.” Along with his former girlfriend, Liz (Mary McDonnell), Bishop’s team steals the box and discovers that it may be able to break into any computer system in the world. Now, Bishop and his team are caught between dangerous factions who would kill for the box, so they must embark on their most dangerous assignment to date. 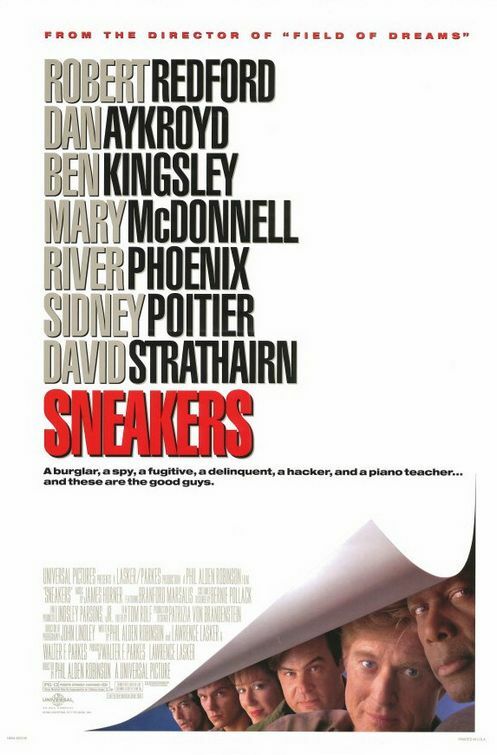 A combination caper film, mystery, espionage thriller and comedy, Sneakers featured an all-star cast when it debuted in late summer of 1992. The blend of star names (Robert Redford and Dan Aykroyd), legendary film figures (Redford again and Sidney Poitier), acclaimed character actors (Mary McDonnell and David Strathairn), and a young gun (the late River Phoenix) gave something for everyone in the audience. The subject matter may have been a bit over the head of much of the audience at the time. The home computer had not yet come into widespread use, and hackers remained a fringe news item, as most people yet did not realize the growing part computers were playing in their lives, so they didn’t understand the dangers of hackers who could break the encryption codes of security networks. Also, Sneakers is an action-thriller with no hyper-kinetic action scenes, but the film was a hit. It’s an espionage and (ostensible) spy thriller without that razor’s edge of tension a film such as Patriot Games gives the audience. For me, Sneakers remains a personal favorite. It’s a brilliant (seriously) caper film that uncannily has the perfect mixture of comedy, action, and suspense with all the ingredients measured correctly to a fraction. No one actor really shines; in fact, Redford’s Bishop is an odd action lead, but somehow this works. Chemistry exists here, although it seems that the cast and characters occasionally rub each other the wrong way. Something else about the film that always stands out for me is James Horner’s score, with Branford Marsalis on alto saxophone (I think). Horner’s sweet compositions with Marsalis delectable sax playing are perfect for comic caper flick. This was another feather in the hat for a unique and highly imaginative film composer who always seemed to create film music that perfectly captured a movie’s tone. A little more than six years later, Horner would finally win two long-deserved Oscars for writing a theme song and scoring Titanic. Sneakers is a nice look back at what was then new technologies, and it boggles the mind how that new tech inspired three men to make such a film as this. 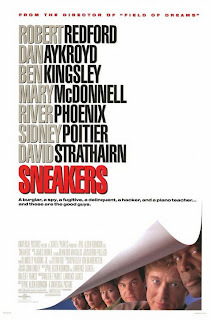 While Sneakers is more an exercise in the caper/heist genre than it is a treatise on the consequences of certain people having unlimited access to private information and the ability to manipulate that info, Sneakers remains a pleasant little treat for those who want something different in their high tech thrillers. Sir William McCordle (Michael Gambon, The Insider) and Lady Sylvia McCordle (Kristin Scott Thomas) invite many family and friends to their old style, English country estate for a weekend shooting party. Sir William has been the financial benefactor for many of his guests, some needing him more than others and him rejecting the needs of some. When Sir William is discovered dead in his study, everyone: family, guests, and their servants are suspects. Directed by Robert Altman (The Player, Short Cuts, Nashville), Gosford Park is written in the fashion of an Agatha Christie whodunit, her brand of mystery story that was sometimes set in an old country manor. Altman, a master of the ensemble cast, uses this large cast of British thespians with the flair of a wizard and the skill of great director. Altman creates a pace for Gosford Park that is as still and as measured as a Merchant Ivory production, but underneath the stiff veneer is a film that is as sharp and as full of wit as the best comedies. Every time that Altman seems to start to slip in his craft, he unleashes something that is so rare in films this day: a movie in which the story, setting, and cast are so well played that the audience is knocked off its collective feet. With each marvelous comeback, we believe in him even more. Gosford Park has the kind of execution that brought us to our feet in The Player. The script by actor Julian Fellowes from an idea by Altman and cast member Bob Balaban is, too say the least, excellent. To use such a large cast in which each and every actors plays what amounts to a major part in the film, even on small screen time, is rarely seen, and is usually reserved for the stage. To write a script that does this in a movie that is barely over two hours long is to understand quality over quantity. There are no big named stars here waiting to chew up scenery and to have their Oscar soliloquies. Fellowes creates a story that has the density and plot lines of a novel, but the brevity of a short story. He does not waste words and scenes, and Altman ably directs the script with the same efficiency. Fellowes wry take on class and social status is uncanny; he sums up British society in the time it would take most writers to begin their introduction to the topic. Gosford Park is a movie of good performances. Maggie Smith as Constance, Countess of Trentham and Helen Mirren as the housekeeper, Mrs. Wilson earned well-deserved Oscar nominations. Ms. Smith sets the stage and creates the atmosphere for this drama, comedy, and mystery. She embodies British reserve, attitude, and wit, but it is in those moments when she surprises with some unexpected line or sudden glance that she really defines the chameleonic nature of this film. Ms. Mirren well represents the hurt, the lies, and the secrets of Gosford Park; she is want and fulfillment so held in check that when it burst forth, someone must die. Ryan Phillippe, Stephen Fry, Clive Owen, Ron Webster, Emily Watson, Kelly Macdonald, and Alan Bates among others of this fine cast all do wonderful work. It boggles the mind what these actors do with a great script and one of the great directors. 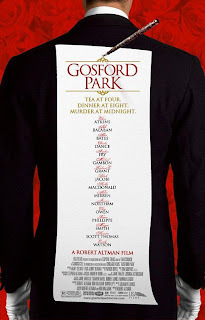 Gosford Park has as its foundation a well know genre, and it does not refute the trappings of this genre. While a mystery novel must play to its conventions, Gosford Park allows the human dramas to tell the story. Each character’s story and motivation underlies the story, and every character has at least one moment in the spotlight. As motives come forth, the film casts off its whodunit costume and becomes a real drama and witty satire on class. Like life, it is a comedy and mystery, and, like life, the story and its characters remains intriguing even as it ends. It’s one of those special films that waits for a viewer hungry for some meat to go with the sugary plate most films offer as their sole course. The 43rd NAACP Image Awards winners were announced in a ceremony, February 17, 2012 and broadcast live on NBC. I was caught up in two basketball games broadcast on ESPN Friday night, so I had to get help from the Associated Press via the Miami Herald to get this information to you, dear readers. Motion Picture directing: Salim Akil, "Jumping the Broom"
Lucky Fans Can Be at the World Premiere of "Titanic 3D"
The search for the biggest TITANIC fan has launched! Fans of TITANIC can enter for a chance to win a once-in-a-lifetime trip to the World Premiere in London on March 27th. TITANIC returns to theaters on April 4 in 2D, Real D 3D and IMAX 3D. 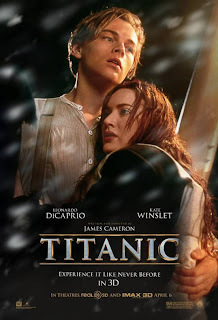 · Visit the Titanic Facebook page at http://www.Facebook.com/TitanicMovie to get to the Biggest Fan Contest tab. · Select a photo to submit either from your Facebook albums or from your desktop. · Fill out a short form with your contact information as well as a few words about the first time you saw Titanic. Called “A spectacular demonstration of what modern technology can contribute to dramatic storytelling” by Variety upon it’s release in 1997, the long in the works 3D conversion was overseen Cameron and his Lightstorm producing partner Jon Landau who produced the hit movie. TITANIC returns to theaters for a limited engagement beginning April 4th in 2D, Real D 3D and IMAX 3D. Lightstorm Entertainment is a film production company founded by Academy Award winning filmmakers James Cameron and film producer Jon Landau. The company has produced blockbuster hits including “Terminator 2: Judgment Day,” “True Lies,” as well the Academy Award® winning “Titanic” and most recently “Avatar,” which stands at the biggest grossing movie of all time. February 2012: Negromancer History Month?